The Quaker way is based on the conviction that there is 'something of God in everyone'. And so, our worship is the time spent with others when we attend quietly to this divine spark within. Other Friends may call this a listening to the inner voice or being open to the inner light. Can you just walk in? Who goes to Quaker Meeting? Everyone is welcome to attend meeting. As you come through the outer door you will get friendly smiles and someone is there to open the door into the main meeting room. If it is your first visit you may be given an information pack to help you understand what is going on and why. 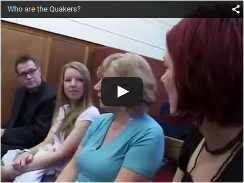 Who goes to Quaker Meetings? Sadly, there are some unhelpful and outdated clichés attached to Quakerism. Quakers, or Friends as we call ourselves, are just friendly normal people! Even so, visitors may be unsure what to expect. First of all, people do not dress up! They wear everyday clothes, seldom is anyone particularly smart. There are people of all ages and types. Of course some are members, but many are attenders, that is people who worship with us but have not (yet) applied for membership. Some attenders do go on to become Quakers, others are content long term just to be part of the meeting. People may have a completely different faith but also choose to attend Quaker meetings. As you go in you are struck by the simplicity of the room. There are no ornaments or church-like decorations. There are no distractions. Chairs are arranged in circles around a central table. The table is used later on as somewhere to put notices and leaflets. 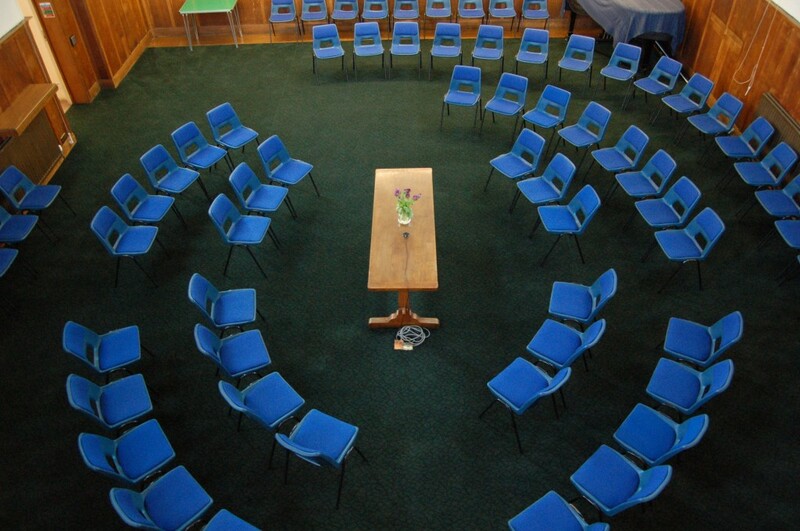 Quakers say that meeting for worship begins when the first person has sat down in the meeting room. So, unless you are the first person, you will see people sitting silently, generally with their eyes closed. You can sit wherever you like, perhaps pick up a copy of the Bible or a Quaker book if you want to. Hopefully, after the time of the start of the Meeting, only one or two latecomers will slip in. Then everything is peaceful and quiet, with the odd cough maybe! 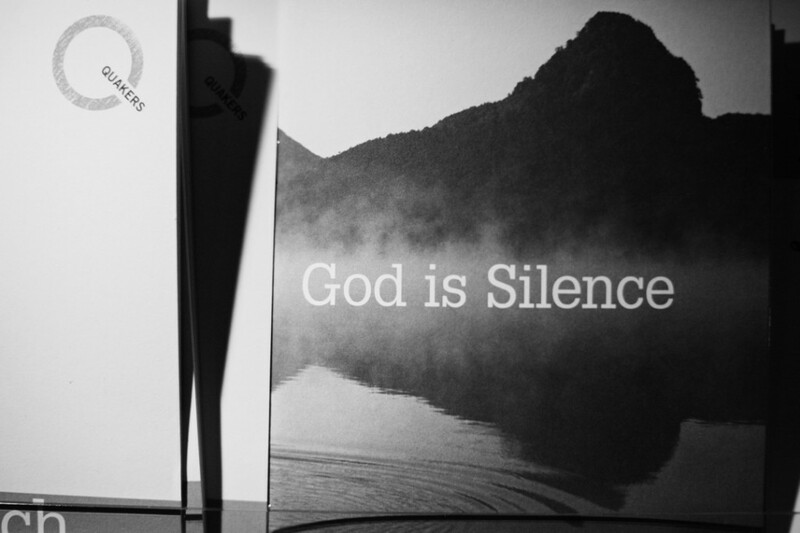 After a certain time, when a stillness has taken hold of the worshippers, someone may stand up feeling led to speak. A meeting for worship is not a discussion group. Words spoken, called spoken ministry, are for the deepening of the act of worship and at best are given out of a feeling that one is compelled to give them. They are followed by a period of silence so that all present may have the time to reflect on them. Other ‘ministers’ may likewise speak when they feel inspired to do so. Friends have found it best that people speak once only and the fewer words the better, so that they can concentrate on the message given. Sometimes there is silence throughout the whole meeting. After the shaking of hands, which marks the end of meeting, visitors from other Quaker groups bring greetings. Newcomers, whether they are attenders or Quakers, are invited to introduce themselves. But they do this only if they want to. Notices are read out about events, meetings to come and issues that affect the group. Then tea and coffee are served – a few coins towards the cost are appreciated. People are friendly and someone may introduce themselves to you, if you look as though you feel like socialising. But you will not be pestered in any way. There are books and leaflets on sale with some excellent introductory material. Two Quaker elders who are ready to answer any questions will have been pointed out. There are various opportunities outside the meeting to find out more by joining in discussion groups and other events. Details of these are announced. It is up to you whether to simply attend and share the meeting or whether you want to go further. There is absolutely no pressure or expectation from anybody. Above all it is, quietly … very simple and friendly.